The Problem: You have thousands of photos on your computer. Now months later, how do you find that one digital photo that you know is on your computer somewhere? 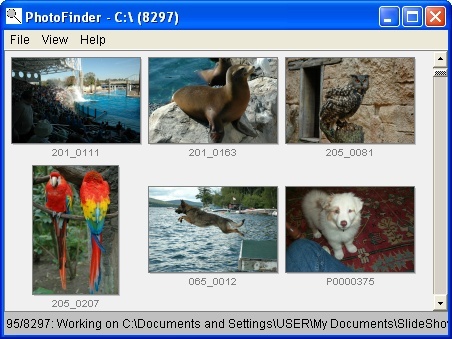 PhotoFinder is the solution: This easy to use program creates thumbnail images for all the photos on your computer and allows you to quickly browse, review, locate and print proof sheets of your digital photos. Program Requirements: Microsoft Windows 10/8/7/Vista/XP/2003/2000/Me/98; Sun's Java Runtime Environment 1.5 (or later) installed. Installing PhotoFinder: Download PhotoFinder, placing it on your desktop or other temporary location. Then run the downloaded EXE (a self-installing EXE) to install the program. PhotoFinder is really easy to use. When run for the first time, it will search your entire hard drive for photos and create very high quality thumbnail images for all your photos. This process may take some time, so just review the PhotoFinder status line to see what it is doing. You may continue to use PhotoFinder during this process. GUI: Use the scrollbar, or the page up/down keys, to scroll through your thumbnails. If you find a thumbnail you want to review in detail, just double-click on it. A detail window will pop up with the original photo. In this detail window, you can again use page up/down to advance through photos. Hard Drive: Use the "File/Scan Drive" option to specify which hard drive you want PhotoFinder to review (eg: C, D, E, etc). Use the "File/Find New/Updated Photos" option to ask PhotoFinder to find new photos that you just placed onto the hard drive. Folder: Use the View/Folder... option to select a folder (and all subfolders). The default is to view all photos in your 'My Documents' folder. Zoom: Under the "View" menu, select the zoom in/out factor (50%, 100%, 200%) for your thumbnails. Print Proof Sheets: Use the "File/Print Proof Sheet..." to create a high quality proof sheet of all the photos in the currently selected folder. Approximately 100 thumbnails will be printed on a standard sheet of paper, so even thousands of photos will not use too many sheets of paper. Where "E" in the command above is the drive letter of the external drive and "photobackup" is the name of a folder on the external drive to contain all photos on your C drive. PhotoFinder is affordware. That means that you (a business or person) may try it for free to see if it works for you. If you can afford the license fee, you should purchase a license. If you find anything wrong with the software, let me know and I will try to fix the problem immediately. You assume the entire risk and liability of using this software. You may not modify the software in any way. The software may not be used on adult sites nor to display adult material. If you violate this license agreement you agree to stop using this software. If you do not agree to these license terms, do not use this software. If you do agree to these license terms, you may purchase a license and use PhotoFinder.